For just a $25.00 annual joining fee you and a guest can see films for just $14.50 each! 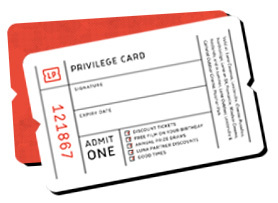 The Privilege Card is not only a great way for our regular customers to save money, it comes with many other benefits attached, and is accepted at Luna Cinemas Leederville, Luna On SX Fremantle, Windsor Cinema Nedlands and Luna Outdoor Leederville, and Camelot Mosman Park in summer! Discounted tickets: $14.50 entry each for you and a guest to any session of any film* for one year from the date of purchase. Please note a $1.50 surcharge applies to each ticket purchased online. A birthday treat: we’ll email you a complimentary double pass for you and a guest to celebrate your special day! Special event & festival discounts: members receive discounted tickets to select special event screenings and film festivals! Discounts with our friends: members receive discounts at affiliated businesses, including: The Black Swan Theatre Company, The West Australian Opera, The West Australian Symphony Orchestra, Musica Viva and The Blue Room Theatre! Please note a $1.50 surcharge applies to each item purchased online. To view the full Terms and Conditions of the Luna Palace Privilege Card membership please click here. 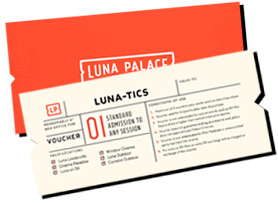 A book of Luna-tics are a great way to spoil a movie-loving friend or to save some money on your own Luna tickets! A book of Luna-tics consists of six movie tickets and costs just $93, so rather than paying $20 for each Adult ticket, the price becomes $15.50 each and you can save a total of $27! Luna-tics can be purchased in person at any of our cinema box offices (and come in a handy fold-up format with perforated tickets so you could even split them up as gifts for a couple of friends!) or online, and you’ll receive a convenient email, with barcodes you can print or simply display on your smart phone to redeem! Please note Luna-tics are valid for six months from the date of purchase, and only 2 tickets can be used on the day of purchase. Lunatics are not valid where a higher than normal ticket price applies ie Special Events, Film Festivals, Met Opera, NT Live etc. or where a third party has hired the venue. Please note a $3.50 surcharge applies for a book of Lunatics when purchased online. A book of Senior-tics is a great way to spoil a grandparent or senior loved one, or to save money on your own tickets if you hold a government issued Senior Card! A book of Senior-tics consists of six movie tickets and costs just $78, so rather than paying $14.50 for each Senior ticket, the price becomes $13 each! Senior-tics can be purchased in person at any of our cinema box offices (and come in a handy fold-up format with perforated tickets so you could even split them up as gifts for a couple of friends!) or online, and you’ll receive a convenient email, with barcodes you can print or simply display on your smart phone to redeem! Please note Senior-tics are valid for six months from the date of purchase, a valid government issued Senior Card must be presented upon redemption, and only 2 tickets can be used on the day of purchase. Senior-tics are not valid where a higher than normal ticket price applies ie Special Events, Film Festivals, Met Opera, NT Live etc. or where a third party has hired the venue. Gift Vouchers can be purchased in person at any of our cinema box offices (and come in a postcard format with space for a personalised message and an envelope to gift them in!) or online, and you’ll receive a convenient email, with barcodes you can print or simply display on your smart phone to redeem! Please note Gift Vouchers are valid for twelve months from the date of purchase, a valid concession card must be shown when redeeming a Concession Gift Voucher and a valid government issued Senior Card must be presented when redeeming a a Senior Gift Voucher. Gift Vouchers are not valid where a higher than normal ticket price applies ie Special Events, Film Festivals, Met Opera, NT Live etc. or where a third party has hired the venue. Please note a $1.50 surcharge applies to each item purchased online. Please note a valid card showing proof of entitlement must be shown to receive a discounted ticket price, and a higher than normal ticket price applies to most of our Special Events and Film Festivals, so please check the special events page for ticket pricing. For 3D films add an extra $3.00 per ticket. All of our cinemas are now fully licensed. Only at Luna Leederville is it a requirement that under-18's must be accompanied and supervised by a responsible adult. Adventurous Women, AFI, AWG, Alliance Française de Perth (AFWA), Ausdance WA, Art Education Assoc. WA [AEAWA], Artsource, Black Swan State Theatre Company, Blue Room Theatre, Beatty Park Leisure Centre members, Community Arts Network (CANWA), Country Arts WA, Fremantle Arts Centre, FTI WA Inc, Fly By Night Club, Friends of the Art Gallery WA, Friends of Kings Park, IF Club, JazzWA, Media Entertainment Arts Alliance (MEAA), MosArts , Musica Viva, Perth Jazz Society, Perth Centre for Photography [PCP], Perth Theatre Company [PTC], Perth Zoo, PICA, Propelarts, RTRFM, Tura New Music, University Club of UWA, Urban Cinephile Gold Movie Club, West Australian Ballet, WA Opera, WA Symphony Orchestra, WAM, WA Youth Jazz Orchestra. (I.D. cards must be shown), WAI Con, Writing WA. TUESDAY is our CHEAP DAY at the Windsor Cinema and WEDNESDAY is our CHEAP DAY at Luna Leederville and Luna on SX. They're the cheapest tickets in town at $12.00 before 6pm and $14.00 after 6pm! Please note Cheap Tue/Wed ticket prices do not apply on public holidays, or at any of our outdoor venues and excludes Special Events and Film Festivals. Please note a $1.50 surcharge applies per ticket when purchasing online. 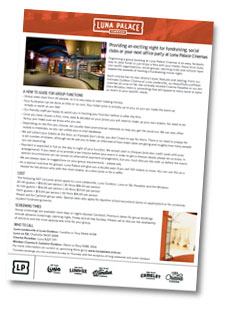 Organising a Group Booking at Luna Palace Cinemas is a fantastic way to raise funds. Many local social clubs, schools and sporting groups have reaped the rewards of hosting a Fundraising Movie Night at our cinemas, raising valuable revenue for their individual projects. Download our "How To" Guide with all you need to know. All you need to constitute a group booking is 20 people, so it's very easy. If required, we are also able to assist with hosting a group function before or after the screening. We are open to suggestions on your own group's requirements, so please ask. Did you know you can hire a cinema at any of our three locations – Luna Leederville, Windsor Cinema (Nedlands) and Luna on SX (Fremantle)? We have a wide variety of cinemas to choose from across our venues – ranging from a small and intimate 20 seat cinema to a grand200+ seats – which means you can choose a location that best suits your needs. We also have comfortable lounge and bar areas at all locations – perfect for pre-screening drinks and nibbles, should you choose. Our bar managers are happy to assist you with bar/candy bar specials or you are welcome to bring your own catering. Sorry, strictly no BYO alcohol. All of our cinemas are fully licensed. Only at Luna Leederville is it a requirement that under-18's must be accompanied and supervised by a responsible adult. So why not choose Luna Palace Cinemas for your next social event? Audio Description (AD) is a device that aids visually impaired patrons. It is for specific individual use and does not impact the standard cinema-going experience for non-users. Closed Caption (CC) viewing systems aid hearing impaired patrons through subtitles (projected onto purpose- made glasses and companion battery pack). These options are available at all Luna Palace locations. To find out if a film does have (AD) Audio Description or (CC) Closed Captions check the film pages. Not all our screens have the option available. Please call the box office or email ahead (24 hours- notice needed) for us to make sure the session is available and ready. We request that the users of the AD and CC facilities allow 10min prior to the start of the session to acquaint them with the technology.